An attempt to restore the reputation of one of professional baseball’s seminal figures. Charles A. Comiskey (1859–1931) was a giant in the early days of baseball. A fine player in the last third of the 19th century, Comiskey’s career segued from the playing field to management to ownership when he established the Chicago White Sox as a founding franchise in the American League. In Comiskey’s day as a slick fielder and savvy, innovative manager, leagues and teams would form and disperse, oftentimes in the middle of a season. With the establishment of the American League, the basic, stable structure of major league baseball as we know it today emerged. Hornbaker’s (Legends of Pro Wrestling: 150 Years of Headlocks, Body Slams, and Piledrivers, 2012, etc.) book serves two purposes. The first is to restore Comiskey to his rightful place as one of the vital figures in the history of the sport. Although the author is not a particularly elegant stylist, his depth of knowledge of this era of baseball history shines through. 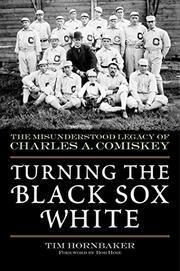 His second main purpose is to redeem Comiskey, who has long taken a disproportionate share of the blame for the 1919 Black Sox scandal, in which eight White Sox players threw the World Series, allegedly as a result of Comiskey’s tightfisted ways. Hornbaker makes a sound case for why Comiskey has long been an inappropriate fall guy for the scandal. But this story only takes up a small part of Comiskey’s life and this book. Why, then, give the book, which is not in fact about the Black Sox scandal on the whole, such a peculiar title, and why make it the foundation of the book’s marketing campaign? In so doing, the author and the publisher do the larger story he tells a disservice. The history of baseball might be far different without Comiskey’s role in it. This serviceable biography ensures that his role will not be forgotten.